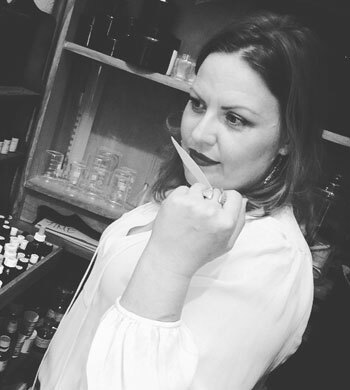 Whether you are a self-confessed fragrance tragic, or are a complete novice and just love smells; Jocelyn will take you on a tour through the wonderful world of fragrance then help you unlock your creativity through making your very own perfume. Using her travelling kit of perfumes and ingredients Jocelyn will take you on a fragrant journey. You will learn about perfumes are made, the stories behind them, and how precious ingredients sourced from all over the globe are used to create olfactory works of art. Once you have gathered a palette of smells to work with, you will learn about how you can blend ingredients to create a perfume. Your imagination is the limit. Do you love flowers or woods, spices or resins? Maybe you’re a gourmand with a love of chocolate and raspberries. You will have a unique opportunity to experience a wide range of fragrance ingredients that have been curated especially for your use for this workshop. Using this treasure trove of scents, Jocelyn will assist you in bring your fragrant inspiration to life. Your creativity, something to write with and a notebook for ideas and inspiration. Jocelyn is an independent perfumer and the creator of Cult of Scent; an artisan fragrance brand based in Sydney (since 2009). Her short workshops on perfume and olfaction are both fun and technically informative and are unique in that the interests and stories of each group of people she teaches become a part of the guide for each session. Preferring to take a collaborative rather than didactic approach, she is happy to work with all levels of experience and this enriches the process for all involved. She loves to hear your fragrance stories, and will incorporate these into the session. When not working with fragrances, Jocelyn may be found teaching Botany, Pharmacognosy, Chemistry, Herbal and Cosmetic manufacturing to Beauty, Naturopathic and Herbal medicine students.